As always - I would like to point out - not everything on the bingo card are items I think will be announced. 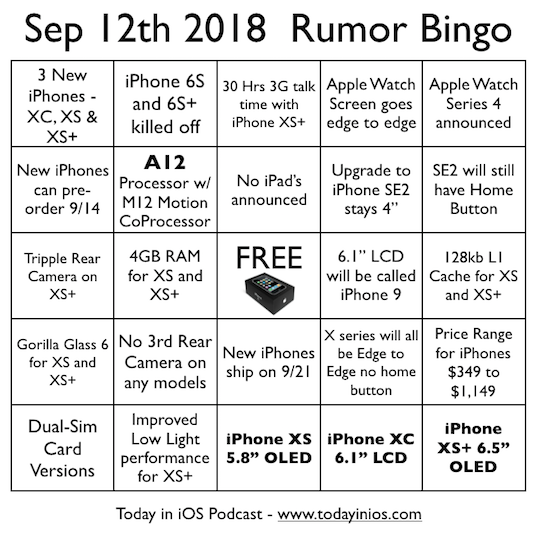 However these are the top rumors out there leading into the September 12th 2018 keynote event. Remember the event will be live streamed September 12th at 1:00 PM ET / 10:00 AM PT - http://www.apple.com/apple-events/ Live streaming requires an iOS device, Safari on a Mac, An Apple TV or PC with Microsoft Edge on Windows 10. Please leave comments about the live event in the post that is pinned to the top of the Tii Google+ community - go there to add in your comments live as the keynote unfolds. Per the Rumor Bingo card above for those sight impaired and using Voiceover. Below is the actual layout of the bingo card going left to right in plain text.